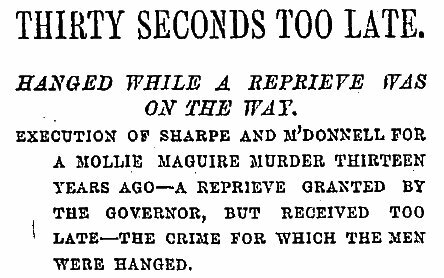 On this date in 1879, two Molly Maguires hanged in Mauch Chunk, Pa., while their reprieve waited for them just outside the door. John Kehoe may have been the symbolic last chapter in the Mollies‘ suppression, but Pennsylvania didn’t intend to forego its mopping-up operation. James McDonnell and Charles Sharpe (or Charles Sharp) had been convicted of murdering George Smith in 1863; like other Molly Maguire crimes, this one either (take your pick) languished for 13 years until the criminal enterprise that authored it was toppled, or was plucked from obscurity as a pretext on which to condemn the men on rather doubtful evidence. But as Maguire cases go, these were small fry … and it’s the sad circumstances of their end and the evocative description of the scene under the gallows that attracts our attention today. An execution which it was thought would be one of the quietest hangings that ever took place in Mauch Chunk has proved the most exciting. A reprieve from Gov. Hartranft arrived here one-half minute after the drop fell — just 30 seconds too late to save the lives of the condemned men. A scene of great excitement took place in the jail; but, although the condemned men had been hanging only a few minutes, there was no movement made toward cutting them down. The telegraph messenger reached the jail door before the drop fell; but no attention was paid to his knocking and ringing, the wife of one of the men having previously been extremely violent outside. When the drop fell the knocking and ringing continued, and the Sheriff sent out a man to arrest the persons whom he imagined to be creating a disturbance. It was then found to be the telegraph messenger with a reprieve. A brother of McDonnell, who had been kneeling by the scaffold, arose and excitedly charged the Sheriff and the bystanders with the murder of his brother. The excitement spread, and the Sheriff appealed to one of the priests, who exonerated him from blame. Amid this excitement and the reproaches of the maddened brother of McDonnell and the wailings of the bereaved families outside, the hanged men were forgotten, and their bodies remained suspended for 30 minutes after the drop fell. There is no reasonable doubt, however, that both were dead when the reprieve came. It should be noted that the reprieve was not an outright commutation, only a stay of the sentence for a few more days. Nevertheless, the melodramatic affair led the Times to wax lyrical. [F]rom this time out the condemned man at the foot of the gallows may not only hope that a reprieve may arrive for him at any moment, but he may take off his thoughts from the certain doom before him and be agonized with the reflection that the boon which he waits for may come when his life has gone past recall. If a stay of proceedings is to be granted at all, it should be granted while the condemned man’s life may be said to keep the case open. It is a refinement of cruelty to keep hope alive and quivering at the foot of the gallows.